Many important nutrients are lost to a greater or lesser degree when food is cooked by ordinary methods. In particular, the water-soluble vitamins – B-complex and C – may be largely lost by careless cooking and storage. 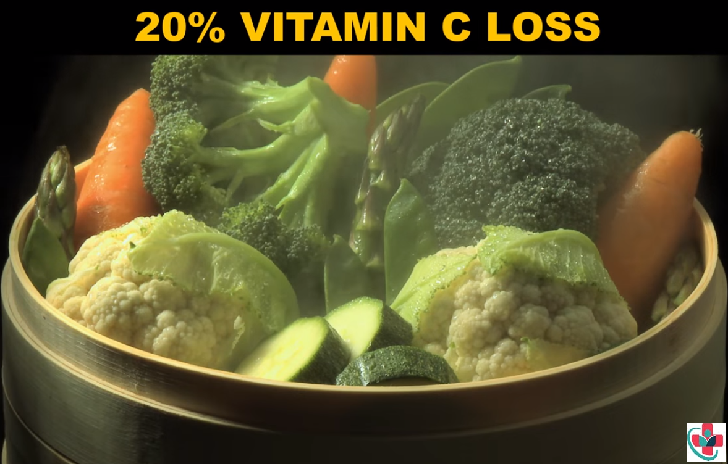 Vitamins C is the most unstable of all the vitamins and if by observing the following rules for cooking, this vitamin can be largely retained, other important nutrients, including iron, will also be preserved in significant amounts. Fortunately, some of our food sources that are highest in vitamins C, the citrus fruits, are best eaten raw. Fruits and vegetables together supply well over 90 percent of our vitamins C.
Follow the practical suggestions listed below in order to retain the most nutrients while cooking your food, and remember the four nutrients robbers are air, water, heat, and light. ➲ Use a little water as possible during cooking. ➲ Have the water boiling for about one minute before adding the food. ➲ Let the water simmer rather than boiling vigorously. ➲ Save the leftover water to use as vegetable stock for gravy or soup. ➲ Cut the vegetable into large, uniform pieces just before cooking. Leave the peeling or skin on when possible. The smaller the pieces being cooked, the larger the area exposed to water, and therefore the greater the vitamin loss will be. ➲ Use the shortest cooking time possible. Serve vegetables tender and crisp, not soggy and mushy. ➲ Serve food immediately after preparation. Do not keep it hot for a long time before serving. Plan your meals so that reheating of food is done as seldom as possible. Cover and refrigerate leftover foods right away. ➲ Keep cooking vessels tightly covered. ➲ Cooking by steaming or pressure cooker will serve about 30 percent more of the vitamins than boiling. ➲ Do not add soda to cooking water, because this destroys vitamin C and some of the B-complex vitamins. ➲ Food that is high in vitamins C should not be cooked in copper or iron vessels. ➲ Store fresh fruits and vegetables in a refrigerator and prepare them immediately before they are to be used. Do not let them stand in water or remain exposed to air any longer than is necessary. ➲ Place frozen food directly into boiling water after removing from the freezer. Do not permit the food to thaw first. ➲ Keep orange juice covered and in the refrigerator. Drink fresh orange juice immediately after squeezing. Do not leave it exposed to the air. Apples, sour Baked, medium hot oven, 30 minutes. Apples, sweet Baked, medium hot oven, 45 minutes. Asparagus, whole Boiled 10 to 15 minutes. Beans dried Boiled until tender, about 2 to 3 hours. Broccoli Boiled 10 to 15 minutes. Carrots sliced Boiled until tender, 10 to 15 minutes. Cauliflower, pieces Boiled until tender, 8 to 10 minutes. Corn on the cob Boiled 6 to 10 minutes. Eggplant Baked in a hot oven, 30 minutes steamed, 15 to 20 minutes. Eggs, soft-boiled Put in boiling water, turn the heat off and allow to stand for 7 or 8 minutes. Gems and muffins Quick oven, 375°F for 25 minutes. Onions, small Boiled 10 to 15 minutes. Onions, large Boiled 20 to 30 minutes. Parsnips, whole Boiled 20 to 30 minutes. Potatoes Boiled 15 to 30 minutes. Potatoes Baked in a hot oven, 45 to 60 minutes. Rice, brown Boiled 40 to 50 minutes. Rolled oats Direct boiling, 15 minutes double boiler, 1 hour. Squash Boiled, whole, 10 to 15 minutes. Boiled, pieces, 8 to 12 minutes. String beans, whole Boiled until tender, about 10 minutes. Sweet potatoes Baked, hot oven, 45 to 60 minutes. Boiled 20 to 35 minutes. Tomatoes, whole Boiled 10 to 15 minutes. Turnips, whole Boiled until tender, 20 to 30 minutes. Turnips, sliced Boiled 15 to 20 minutes. Whole grain rolls and biscuits Quick (hot) oven, 20 to 25 minutes.